By Jim Purpura. Posted March 13, 2012, 9:01 AM. The most significant rainfall since November and potentially low snow levels look to be headed our way this weekend, in what will be this winter's final storm. 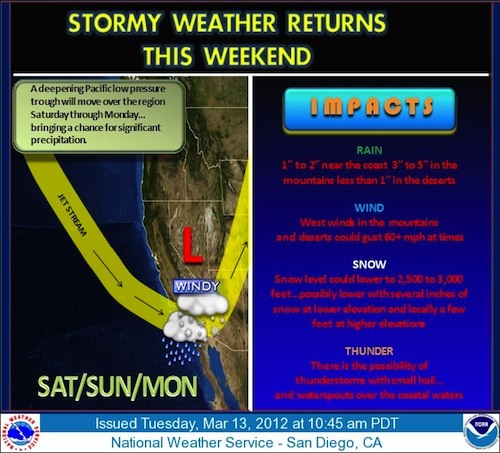 Forecasters are watching a storm system moving into Northern California this week. The storm is both quite cold and moisture-laden. Computer models indicate rainfall could exceed 10 inches in some Northern California mountain areas before the storm is done. Snowfall will be measured in feet at resorts in the region. Late in the week the storm will shift a bit south, and Southern California should receive some much needed precipitation. For the Saturday through Monday period, expect rainfall of one to two inches in the valleys, and three to five inches of rain in the mountains, especially the west facing slopes. Snow will fall at elevations above 2500 to 3000 feet. Several inches could fall just above that elevation, along with a foot or more of snow at the Southern California mountain resorts. The cold air mass will set the stage for showers and thunderstorms as well. Look for the possibility of heavy rain and even small hail with thunderstorms, or heavier showers. The rain and snow will impact travel. Look for snow to affect the Cajon and Banning Pass areas. In the Ventura County Mountains, Highway 33 may be affected by snow, and look for snow across the Grapevine area of Interstate 5 as well. Spring begins next Monday, just as the system is exiting the region.